This rare ornament is made as a of a Tennis Etui with a wooden racket. Container made of embossed Dresden paper. Good condition all over. Also suitable for a doll house. 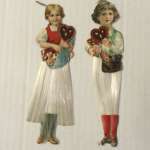 Ca 1890 Size 9 cm/3,5""
Christmas ornaments:A fine group of Donald Duck celluloid figures. Disney. Ca 1940. 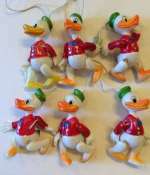 Here is a wonderful lot of Vintage Celluloid Donald ducks. Made of Celluloid. I have 10 of these. Great as ornaments for Christmas or for Disney collectors. Each standing figure is ca 3" (8 cm) . 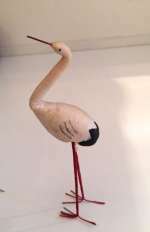 Each has movable arms and a string attached for hanging.. Good condition. Some with loose string. NOTE:The price is for one item. Discount for the group. Antique Christmas ornament of Children made of spun glass and scraps. Ca 1900. This is a great ornament of Children made of spun glass and scraps. 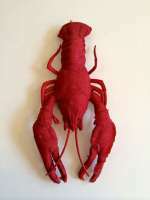 Ca 1900. . H.15 cm /6".Fine condition. All original. NOTE: THE PRICE IS FOR EACH. 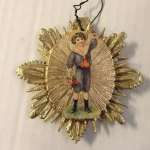 Fine large antique Dresden Christmas Ornament. Golden.Christbaumschmuck. 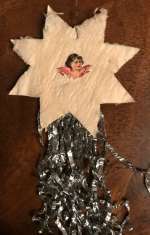 This is a large Dresden Christmas Ornament with angels. It has a middle space to hold Christmas greetings. 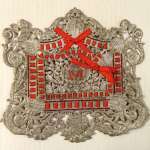 Fine pressed Dresden Cardboard with red ribbon in excellent condition. H. 20 cm / 8". W. 30 cm/ 11". All original.